Taurus Rising gives you a stubborn streak, combined with a sturdy physique and tremendous physical stamina. Tenacious in getting what you want, your great patience can be the very key to your success. You need, however, to overcome a tendency to procrastinate and a certain difficulty with undesirable habits and behavioural patterns. 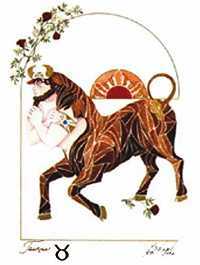 Taurus has materialistic, status-seeking tendencies. You take pains to hide it, but you can be unduly influenced by the powerful or wealthy. Although your practicality is often self-serving, you are pragmatic and can usually be relied upon for constructive suggestions that help others as much as yourself. The finer things in life must include art and music, for you are innately talented, with a pleasant, resonant voice. Beware of infections and injuries to your neck and throat and you are subject to earaches and infections.